❤3-YEAR WARRANTY (100% MONEY BACK GUARANTEE):❤ THZY Projector offer our customers a 3-year 100% Money Back Guarantee. If your projector has any quality issues, please contact our customer service immediately. We will definately help you solve it. 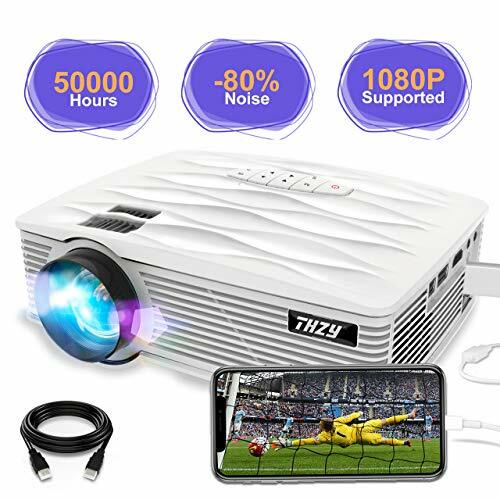 THZY projectors is fit for playing videos, TV series, photos sharing, football matches etc. It can be easily connected with your smartphone, PS3, PS4, X-Box ONE or Wii to enjoy BIG games. It provides a watching size from 32" to 176" with the projection distance between 1.5m-5m (Ideal distance is 3.5M with 120'' display). THZY projectors are equipped with an innovative cooling system with heat dispersion, as well as a noise suppression technology which cuts fan sound in half. THZY 2018 upgraded LED lighting provide 2200 luminous efficiency. Supporting 1920x1080 resolution, 2000:1 contrast ration which is ideal for home entertainment. Not recommend for PPT or office presentation. If you have any questions about this product by THZY, contact us by completing and submitting the form below. If you are looking for a specif part number, please include it with your message.